San Francisco, CA, USA – UC San Francisco researchers, in collaboration with the unique Brazilian Biobank for Aging Studies (BBAS) at the University of São Paulo, have shown that the earliest stages of the brain degeneration associated with Alzheimer’s disease (AD) are linked to neuropsychiatric symptoms including anxiety, depression, loss of appetite, and sleep disturbances. The findings – published in their final version October 15, 2018 in the print edition of the Journal of Alzheimer’s Disease following preliminary online publication in September – could lead to earlier diagnosis of AD and prove a valuable biomarker in the development of therapies to slow the course of the disease, the authors say, but may also have broader implications for understanding the biological basis of psychiatric symptoms in older adults. Though commonly associated with memory loss and dementia, Alzheimer’s disease is actually a progressive neurodegenerative condition that can be detected in a brain autopsy decades before these classic cognitive symptoms occur. A “Holy Grail” of Alzheimer’s research is to develop treatments that could be given in the disease’s earliest stages to protect brain tissue from further loss and to slow or prevent the eventual development of dementia. However, the development of such drugs will require a better understanding of the biology that drives the first stages of the disease and the ability to diagnose patients early enough to prevent extensive loss of neural tissue. Many studies have identified correlations between neuropsychiatric symptoms such as depression, anxiety, and sleep disturbances and an eventual Alzheimer’s diagnosis, and some have even proposed that these symptoms could be used as biomarkers for the disease in its earliest stages. But the relationship between the two has remained murky. In fact, some researchers have proposed that depression and other psychiatric conditions, or even the drugs used to treat these conditions, could themselves be triggers that lead to the onset of dementia decades later, much like occasional seizures can contribute to the development of chronic epilepsy. Now members of the lab of Lea Grinberg, MD, PhD, in the UCSF Weill Institute for Neurosciences’ Memory and Aging Center, working with Brazilian colleagues, have shown that psychiatric symptoms are tightly linked to the earliest stages of Alzheimer’s brain pathology. These results strongly suggest that neuropsychiatric conditions or treatments do not cause Alzheimer’s, but could be the earliest warning signs of the disease. The research took advantage of São Paulo’s unique century-old autopsy service, which is mandated in all deaths and conducts approximately 15,000 autopsies per year. In 2003, as part of her doctoral research, Grinberg co-founded the BBAS to collect brain tissue samples from these autopsies, and BBAS has since grown to become the largest such resource in the world. Most postmortem brain studies of AD use relatively small “convenience samples” from older individuals who already show signs of memory loss or dementia. Because multiple brain pathologies can accumulate with age, it can be difficult to tightly link specific AD-related symptoms to brain abnormalities detected in these samples. Thanks to the BBAS collaboration, however, Grinberg’s team was able to avoid these potential pitfalls by drawing from a much larger population, selecting brains from younger and healthier individuals, and excluding tissue samples with multiple competing pathologies. In the new study, lead author Alex Ehrenberg, a neuropathology research associate in the Grinberg lab, worked closely with Claudia Suemoto MD, PhD, and other colleagues from the University of São Paulo to study the brains of 1092 seemingly healthy adults over the age of 50 who closely represented the general population of São Paulo. The researchers excluded 637 brains that showed neurological signs of brain abnormalities not related to AD, leaving 455 brains with either no signs of degeneration or a range of AD-related pathology. 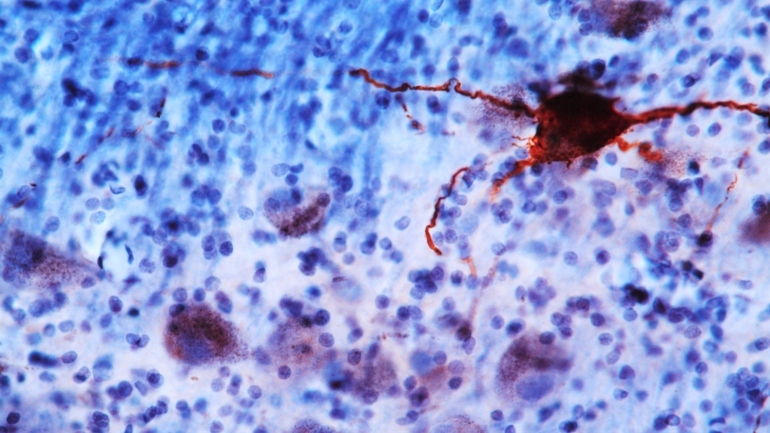 AD pathology is characterized by buildup of telltale neurofibrillary (NF) tangles and amyloid-beta (Aβ) plaques, paralleled by the atrophy of brain tissue in associated regions. The disease nearly always progresses in the same fashion, with NF tangles first appearing in brainstem regions associated with sleep, appetite, and emotional processing, while Aβ plaques first appear in cortical regions and then spread to deeper parts of the brain. Ehrenberg and colleagues classified each of the 455 brains using standard scales of AD progression based on NF tangle and Aβ plaque accumulation. They then used statistical algorithms to test for a relationship between AD stage and reported changes in the brain donor’s cognitive and emotional status prior to their death, based on interviews with informants – typically relatives and caretakers – who had been in at least weekly contact with the deceased in the six months before their deaths, a gold-standard approach for neuropathological studies of degenerative brain diseases such as AD. Ehrenberg’s computational analysis of the results found that in individuals whose brainstems showed the very earliest stages of NF tangles but lacked memory changes, family members and caretakers reported increased rates of one or more neuropsychiatric symptoms including agitation, anxiety, appetite changes, depression, and sleep disturbances, but lacked any noticeable memory problems. The next stage of the disease, as NF buildup increased in the brainstem and began to spread to other brain regions, was associated with increased odds of agitation, while only in later stages, as NF buildup began to reach the brain’s outer cortex, did the individuals begin showing signs of the dementia-like delusions and the cognitive and memory decline typically associated with AD. Tellingly, the researchers found no link between buildup of Aβ plaques and these neuropsychiatric symptoms. 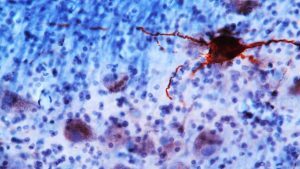 Alzheimer’s researchers have long debated whether Aβ plaques or NF tangles – made up of clumps of a protein called “tau” – play an earlier or more central role in driving neurodegeneration in AD, and the authors believe the new findings add additional support for focusing on developing tau-targeted treatments, particularly given disappointing results from many recent trials of Aβ-targeted AD therapies. “These results could have major implications for Alzheimer’s drug trials focused on early degenerative changes, where people have been seeking tractable clinical outcomes to target in addition to early cognitive decline,” Ehrenberg said. He added that the findings will also be valuable as new technologies become available for detecting early stages of AD pathology in living patients – such as blood biopsies or PET brain imaging of tau – to aid the implementation of such novel biomarkers into clinical practice. To Grinberg, the discovery that psychiatric symptoms such as depression or sleep disturbance in older adults may be linked to a specific biological phenomenon – namely accumulation of tau protein into NF tangles in the brainstem – is as exciting as the implications for Alzheimer’s disease itself. NF tangle in brainstem (credit: Grinberg Lab/UCSF). Full study: AJ Ehrenberg, CK Suemoto, E de Paula França Resende, C Petersen, REP Leite, RD Rodriguez, RE de Lucena Ferretti-Rebustini, M You, J Oh, R Nitrini, CA Pasqualucci, W Jacob-Filho, JH Kramer, JR Gatchel, L Grinberg (2018) “Neuropathologic Correlates of Psychiatric Symptoms in Alzheimer’s Disease” J Alzheimers Dis 66 (1) 115–126 (doi: 10.3233/JAD-180688). The study’s senior/corresponding author was Lea T. Grinberg, MD, PhD, an associate professor of neurology at UCSF and member of the UCSF Memory and Aging Center, UCSF Weill Institute for Neurosciences, and UCSF Global Brain Health Institute. The study’s lead author was Alexander J. Ehrenberg, a neuropathology research associate in the Grinberg lab. Other authors on the study were Elisa de Paula França Resende, MD, Cathrine Petersen, Michelle You, Jun Oh, and Joel H. Kramer, PhD, PsyD, all of UCSF; Claudia K. Suemoto, MD, PhD, Renata Elaine Paraizo Leite, PhD, Roberta Diehl Rodriguez, MD, PhD, Renata Eloah de Lucena Ferretti-Rebustini, RN, PhD; Ricardo Nitrini, MD, PhD, Carlos Augusto Pasqualucci, MD, PhD, and Wilson Jacob-Filho, MD, PhD, all of the Universitty of São Paulo; and Jennifer R. Gatchel, MD, PhD, of Massachusetts General Hospital and Harvard Medical School. The research was funded by the National Institutes of Health (R01-AG040311, K24-AG053435), the John Douglas French Alzheimer’s Foundation, the Atlantic Fellows for Equity in Brain Health program, the BrightFocus Foundation, the Alzheimer’s Association, the São Paulo Research Foundation (FAPESP), the Brazilian Coordination for the Improvement of Higher Education Personnel (CAPES), the University of São Paulo Medical School Medical Investigation Laboratory 22 (LIM-22), and Hospital Israelita Albert Einstein, São Paulo. Grinberg has previously received grant funding from AVID Radiopharmaceuticals and parent company Eli Lilly & Co. Kramer has received consulting fees for work with Biogen, Inc., on three occasions in the past two years. Image of NF tangle in brainstem. Diagram of NF pathology progression and associated psychiatric symptoms. Credit: Grinberg Lab / UCSF. UC San Francisco (UCSF) is a leading university dedicated to promoting health worldwide through advanced biomedical research, graduate-level education in the life sciences and health professions, and excellence in patient care. It includes top-ranked graduate schools of dentistry, medicine, nursing and pharmacy; a graduate division with nationally renowned programs in basic, biomedical, translational and population sciences; and a preeminent biomedical research enterprise. It also includes UCSF Health, which comprises three top-ranked hospitals—UCSF Medical Center and UCSF Benioff Children’s Hospitals in San Francisco and Oakland;mdash;as well as Langley Porter Psychiatric Hospital and Clinics, UCSF Benioff Children’s Physicians and the UCSF Faculty Practice. UCSF Health has affiliations with hospitals and health organizations throughout the Bay Area. Please visit: ucsf.edu/news.